Why can’t SOMEONE offer chronological listings? I mean, nothing like buying two books in a series, using publication dates as a guide, only to find those two books worlds and years apart. The reason? There were several books in between, but they weren’t shown on the same screen. Even author sites and fan sites do this. Take Lilian Jackson Braun’s quirky and delightful The Cat Who… mysteries. If you go by the order of Amazon’s listings, methodical journalist Jim Qwilleran and his two crime-solving cats may suddenly jump from a big city newspaper to “400 miles north of everywhere” with no clues whatever. And there are dozens of The Cat Who… books. Although Tony Hillerman isn’t quite so prolific, attempting to arrange his absorbing adventures of modern Navajo cops by release date is still a tall order. Futile, too. Each book isn’t always listed. Some may pop up on one click that didn’t show on a previous visit. Why the heck is that? When I first started following Officer Jim Chee, (the first books in Hillerman’s listing) his superior, Lt. Joe Leaphorn, was a grizzled, gray-haired veteran. In the next book I found featuring that venerable soul, he was a rookie patrolman. And I still haven’t found the original Jim Chee title that got me intrigued in the first place. It was a Reader’s Digest Condensed selection. And we donated our entire collection of those volumes to a library sale. So I may never know. You will not have that problem with me, folks! If you’ll notice the left column, I have clearly placed “Book One,” “Book Two,” etc. in each book’s title. This will get very important when the first three are re-released by my new publisher, VerveStar, with differing covers. There are 5 books in all. Seriously, if anyone out there knows where to find chronological listings of authors’ works, please let me know! I prefer reading things in proper order! And Carmen, bless her heart, would resignedly set down her coffee, grit her teeth, and utter her perfected mantra: “I know it’s ridiculous. I know it’s gratuitously complicated. But it’s do-able. So, like, DO it!” And I would, of course. Sometimes without overtime. Now you’re going to see what I mean. 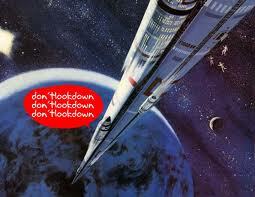 Folks, I give you The Space Elevator. As NASA gets out of the manned spaceflight business, new and cheaper ways of getting into space – without rockets – have been developed by private companies. Running on a strand of woven fiber carbon nanotubes, a space “elevator” will whisk you 22,000 miles above earth to an inflated kevlar-and-fiberglas space station. According to www.absolutely-unbelievable.com, the iSpace Corporation is holding a drawing to win a two-week vacation on the moon. 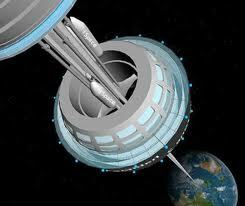 iSpace is already negotiating for land to build this thing. Enter today! Are you ready for the ultimate cruise? I actually saw this on Discovery, or The History Channel or PBS or somewhere. 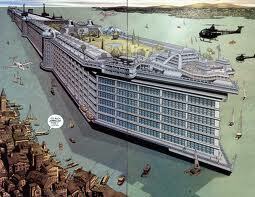 Freedom Ship, a floating city of thousands, is an idea that has been tossed around for a while. Now the Freedom Ship Company has a new set of designs for the floating urban space, which looks sort of like a giant mall parking lot, and sort of like a really giant Love Boat. 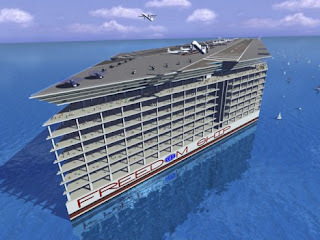 According to the company’s site, http://www.freedomship.com/, it’s not a cruise ship per se. It’s a place to live, work, and retire. A place that just happens to be continuously traveling around the world. So…I suppose it’s not so much a question of is it do-able, but what will happen if we do? And I promise you this will be my last article on my Boeing plant tour! The museum at the visitor’s center is actually called The Future of Flight. Hence, my title. Some of these flights of fancy are seriously on the drawing board. Some of the next generation space shuttles actually went to prototype years ago and now will probably never come into use - unless some corporation or multi-gazillionaire buys them for space tourism. This powerful little twin engine jet is a NASA project called Small Aircraft Transportation System (SATS). The object is to provide high-speed transport between local community airports at current airline prices, sans the delays and extended travel times incurred by hub-to-hub routes. Wouldn’t you love to see this get off the ground? Have you ever noticed the way birds adjust their wings in flight to perform various maneuvers? This NASA design is The Morphing Project which allows planes to change shape in flight. Flexible materials will bend and twist, adapting safely and efficiently to changing flying conditions like the wings of a bird. This morphing technology promises a wide variety of futuristic applications. This high-flying, solar powered Helios prototype was developed by NASA primarily to aid coffee growers. Flying at altitudes over 50,000 feet for up to four days, it can determine the optimal harvest time on remote, mountainside fields. It can also act as a relay platform for telecommunications systems, enhance weather observation, and provide a disaster-monitoring. The blended wing body is a research project of both Boeing and NASA. This design could carry 450 to 800 passengers for up to 7,000 miles at a maximum speed of 560 mph while consuming 20% less fuel than today's jetliners. The wingspan would be just slightly wider than a conventional Boeing 747 and could operate from existing airports. While the benefits of these projects are huge and obvious, I fear the development costs – in the current economy - will strand our access to them indefinitely. 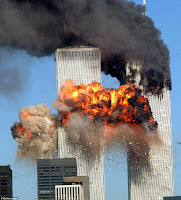 Where were you on the morning of September 11, 2001? You will never forget what you were doing November 22, 1963 when President Kennedy was shot. You know exactly where you were January 28, 1986 when the Challenger exploded. You’ll never forget who called you February 1, 2003 to tell you the Columbia was disintegrating over Texas. How much more vividly do you recall the moment you began to grasp the magnitude of the terrorist attack in New York City? I thought it was just a persistent promo for a new disaster flick. The image of two furiously burning towers stayed prominently on the AOL home page while I checked and briefly answered my email before heading to work. It was in West Lafayette, Indiana, where I was taking care of my folks in their beautiful rural home. It didn’t sink in until I saw the same thing on the TV as I headed out the door. By the time I arrived at the office in Purdue’s Research Park, the whole world was in a state of shock. Voices were hushed. Every TV and computer screen showed variations of the same thing. I remember that after an hour or so of numbly staring at each other, we closed up and went home. Most of all I remember how Dad, still partially paralyzed from his recent stroke, painfully limped out to the pole by the giant sycamore tree, and raised the American flag. The Boeing factory in Everett, WA is so massive; it once began generating its own weather systems. Rain clouds, the result of warm air and moisture accumulating, were actually forming inside. About 25,000 workers added to the heat and humidity. 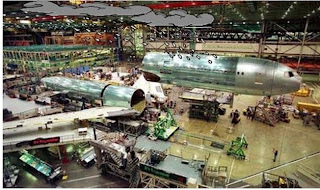 Covering almost 100-acres, the world's biggest building by volume houses Boeing's 747, 767, 777, and 787 aircraft production lines. Roughly 2142 average-sized homes could fit inside this factory. 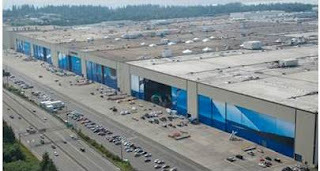 The hangar doors alone are each roughly the size of an American football field. Among other things, it boasts its own security force and fire department, a fully equipped medical clinic, a childcare center, a water treatment plant, its own electrical sub-stations, and 19 cafeterias. But what to do about the rain? Actually, a state-of-the-art air circulation system was installed inside the monolithic manufacturing plant early on. I wasn’t able to find exact dates, but obviously you can’t work with complex electrical systems under such shocking conditions. Nevertheless, it’s true that there’s no A/C on the production floor. First of all, the weather in the Seattle area rarely peaks over 90. If the factory gets too warm, they open the huge doors and turn on the fans. Too Cold? As if. There are over one million light bulbs illuminating the work areas. Remember how your kid could actually bake a cake with a 100-watt bulb in her Hasbro Easy Bake oven? I clench my fists in frustration. I have the map right in front of me. I know exactly how to get there. But here we sit in the motel parking lot while he fusses and cusses at that obstreperous gadget he’s named Giselle. Granted, a manual from the car rental agent would’ve been nice. And, granted, a GPS app on Miranda’s cell totally saved us in New Jersey last May. But right now I’m ready to chuck it full force into the street to which it’s pointing. As if that street was anywhere near us. Husband notices. I glance over but see nothing but a fat green arrow on an otherwise blank screen. Not wishing to escalate either his ire or mine, I calmly return to my book. Too late. “What highlighted route?” Husband thunders. Big mistake. The explosion that just caught Alistair MacLean’s heroes pales beside Husband’s. Giselle was supposed to say that! Why can’t I leave him alone? Why am I always so negative? Finally I understand. Giselle is a man-toy. And men are Über-serious about high-tech toys. Any hint of disparagement from a female can fling a normally equitable man into a towering rage. Unfortunately, Giselle also aggravates the male ego. The problem, of course, is that the voice is female. No man wants a woman telling him where to go. For example, when we returned from our outing she clearly and correctly told him to exit on Pacific Avenue. He decided not to. He ignored her again. He would do it his way – here in a neck of the woods where we’ve never been before. I had the map in my lap, but by now I knew to keep my mouth shut. Eventually, after an extensive tour of Everett, WA, we did end up on Pacific Ave. Which would’ve taken us to the Holiday Inn. Happily, Husband turned right into the Best Western where we were staying. Even after we more or less learned how to use her, Giselle did her level best to take us to the Holiday Inn. So…would I ever want a GPS of our own?